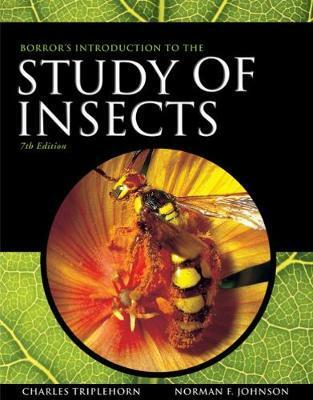 Understand the insect world with BORROR AND DELONG'S INTRODUCTION TO THE STUDY OF INSECTS! Combining current insect identification, insect biology, and insect evolution, this biology text provides you with a comprehensive introduction to the study of insects. Numerous figures, bullets, easily understood diagrams, and numbered lists throughout the text help you grasp the material. 1. Insects and Their Ways. 2. The Anatomy, Physiology, and Development of Insects. 3. Systematics, Nomenclature, and Identification. 7. The Entognathous Hexapods: Protura, Collembola, Diplura. 8. The Apterygote Insects: Microcoryphia and Thysanura. 10. Order Odonata: Dragonflies and Damselflies. 11. Order Orthoptera: Grasshoppers, Crickets, and Katydids. 12. Order Phasmatodea: Walkingsticks and Leaf Insects. 18. Order Zoraptera: Zorapterans, Angel Insects. 22. Order Hemiptera: True Bugs, Cicadas, Hoppers, Psyllids, Whiteflies, Aphids, and Scale Insects. 27. Order Neuroptera: Alderflies, Dobsonflies, Fishflies, Snakeflies, Lacewings, Antlions, and Owlflies. 28. Order Hymenoptera: Sawflies, Parasitic Wasps, Ants, Wasps, and Bees. 30. Order Lepidoptera: Butterflies and Moths. 32. Order Mecoptera: Scorpionflies and Hangingflies. 33. Order Strepsiptera: Twisted-Winged Parasites. 35. Collecting, Preserving, and Studying Insects. 1. Insects and Their Ways. 2. The Anatomy, Physiology, and Development of Insects. 3. Systematics, Nomenclature, and Identification. 4. Behavior and Ecology. 5. Phylum Arthropoda. 6. Hexapoda. 7. The Entognathous Hexapods: Protura, Collembola, Diplura. 8. The Apterygote Insects: Microcoryphia and Thysanura. 9. Order Ephemeroptera: Mayflies. 10. Order Odonata: Dragonflies and Damselflies. 11. Order Orthoptera: Grasshoppers, Crickets, and Katydids. 12. Order Phasmatodea: Walkingsticks and Leaf Insects. 13. Order Grylloblattodea: Rockcrawlers. 14. Order Mantophasmatodea. 15. Order Dermaptera: Earwigs. 16. Order Plecoptera: Stoneflies. 17. Order Embiidina: Webspinners. 18. Order Zoraptera: Zorapterans, Angel Insects. 19. Order Isoptera: Termites. 20. Order Mantodea: Mantids. 21. Order Blattodea: Cockroaches. 22. Order Hemiptera: True Bugs, Cicadas, Hoppers, Psyllids, Whiteflies, Aphids, and Scale Insects. 23. Order Thysanoptera: Thrips. 24. Order Psocoptera: Psocids. 25. Order Phthiraptera: Lice. 26. Order Coleoptera: Beetles. 27. Order Neuroptera: Alderflies, Dobsonflies, Fishflies, Snakeflies, Lacewings, Antlions, and Owlflies. 28. Order Hymenoptera: Sawflies, Parasitic Wasps, Ants, Wasps, and Bees. 29. Order Trichoptera: Caddisflies. 30. Order Lepidoptera: Butterflies and Moths. 31. Order Siphonaptera: Fleas. 32. Order Mecoptera: Scorpionflies and Hangingflies. 33. Order Strepsiptera: Twisted-Winged Parasites. 34. Order Diptera: Flies. 35. Collecting, Preserving, and Studying Insects. Norman F. Johnson is a professor of biology at Ohio State University and curator of the Ohio State University insect collection. His research interests include the systematics of parasitic Hymenoptera and in particular the Proctotrupoidea. His focus to date has been on the Scelionidae, a speciose group important as biological control agents of their hosts. In 1992 he assumed the position of director of the OSU Insect Collection. Charles A. Triplehorn is emeritus faculty at Ohio State University and his broad interests include systematics and biogeography of Coleoptera. His research is primarily on the large family Tenebrionidae, especially those of the Western Hemisphere. Since his retirement from Ohio State in 1992, he has concentrated on two major projects: a revision of the genus Eleodes and of the Neotropical Diaperini. Triplehorn is the former president of the American Entomological Society.